The Society for the Anthropology of Lowland South America (SALSA) is an international professional association for anthropologists specializing in lowland regions of South America. SALSA’s main goals are to foster sound and ethical research on the peoples and environments of lowland South America, and to promote the education of students and the general public on issues that we study. For the organization, the well-being of lowland South America’s vulnerable peoples is of central concern. As anthropologists and regional specialists, we insist on accuracy in scientific research, integrity in interpretation, and defense against misuse of academic writings. 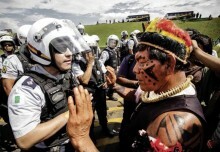 We support the efforts of indigenous leaders, organizations, and fellow scholars who focus the spotlight of public attention on the realities of life for native people in lowland South America and elsewhere, in their struggles to secure the rights and resources they need to survive and thrive as indigenous citizens of the 21st century. It is with great concern that SALSA has learned that the Peruvian, Brazilian, and Chinese governments have signed memoranda of understanding on building a transcontinental railroad network connecting the Pacific coast of Peru with the Atlantic coast of Brazil. The proposed railroad would cut through the western Amazon in the border region between Peru and Brazil, one of the largest continuous rainforest areas in the world with relatively intact primary forest and among the highest biodiversity indexes in the world (see the interactive map). This area concentrates the world’s largest number of indigenous peoples with little or no contact with outsiders from national societies. The majority of these indigenous populations have chosen isolation as a lifestyle in response to their fatal historical experiences with modern society. 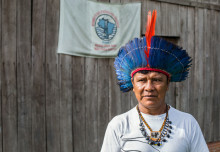 The impact of a railroad cutting through this unique environment will involve severe consequences for the isolated indigenous groups as well as many indigenous peoples whose territories are located along its path. Two main routes have been presented: a northern route would connect the Pacific harbour of Bayóvar of Piura in northern Peru with the Atlantic super port Porto do Açu, north of Rio de Janeiro or else with the port of Santos, south of São Paulo. This route would cross the Andes and then pass through the Amazon city of Pucallpa in the Ucayali Region, the Brazilian city of Cruzeiro do Sul in the state of Acre, and then the Brazilian Amazon and the cerrado. It would cross Rondônia via the cities of Porto Velho and Vilhena, traverse the soy bonanza areas of Mato Grosso and the cattle- ranching center of Campinorte in Goiás, and from there reach the Atlantic. The second proposed route would take a more southern course connecting with the Pacific port of Ica in southern Peru, crossing the high Andes of Puno and Cusco, and from there cut through the Amazon, basically following the recently built Southern Interoceanic highway through Madre de Dios. It would bisect the legally protected Manu National Park and cross into Brazil at Iñapari, from where it would run southeast through Brazil and later connect with the expanding agro-frontier and wider Brazilian network to the Atlantic, as with the first proposed route. Other alternative routes have been proposed, and the Bolivian government has been lobbying for a route through north-eastern Bolivia via Santa Cruz, and then into Brazil in southern Acre and onwards to the Atlantic coast. The northernmost route crosses into Brazil through an area with extremely high biodiversity in mammals, birds, amphibians and plants and with many small isolated indigenous groups with little or no contact with the national society. This area is part of the largest remaining expanses of continuous and relatively undisturbed rainforest in the world. The proposed railroad would cross through the Isconahua Territorial Reservation, which was set up in 1998 for the isolated Isconahua people, who have only sporadic contact with outsiders. As EF 354, the route continues into Acre, Brazil, cutting through the Serra do Divisor National Park, established in 1989 and nominated Tentative World Heritage Site by the Brazilian government in 1998. A corresponding and bordering national park on the Peruvian side with the same name was proposed by a coalition of American and Peruvian NGOs in 2013. In 2006, this area was set aside and designated the Zona Reservada Sierra del Divisor, with the aim of establishing a national park. The isolated groups living in this border zone have been under increasing pressure from illegal loggers and drug traffickers from Peru. Several massacres have been documented, forcing some isolated groups to seek refuge on the Brazilian side of the border, potentially creating conflicts with communities in these areas. Any new infrastructure in the area will exacerbate this situation. Additionally, the route will pass through or otherwise directly affect demarcated and titled communities and lands of numerous sedentary indigenous peoples, such as the Shipibo-Conibo, Ashéninka, Nukini, Puyanawa, and Yaminawá, among others. The Uruaçu (GO)-Vilhena (RO) segment of EF 354 will directly impact A’uwẽ- Xavante, Iranxe, Nambiquara, Mammaindê, Negarote, Umutina and Pareci, and groups located in the southern part of the Xingu National Park, including Kinsede, Yualapiti, and Wauja. If constructed, the proposed railroad will require a variety of feeder and maintenance roads and stations, which together with the railroad itself will inevitably increase colonization pressure and the influx of illegal loggers, drug traffickers, and other extractive interests into the region. This will have serious negative impacts on isolated as well as sedentary indigenous populations who reside in its path. It will also have adverse effects on two biodiversity hotspots: the Ucayali-Acre border zone and the central Brazilian cerrado. EF 354 will exacerbate conditions that many groups are suffering as a consequence of the cerrado soy boom. SALSA strongly recommends against the northern route option to avoid the social, ethnic, and environmental disaster that this route and accompanying road infrastructure will inevitably cause in tropical forest refuges, as well as a large number of Indigenous Territories and protected areas. As proposed, the alternative southern route will cause considerably less devastation than the northern routing, although it is likely to have adverse effects on indigenous lands, the region’s ecology, and the environment. The same holds true for the Bolivian proposal. The precise impacts and affected peoples remain to be determined, since the detailed route has not been published yet, and the impacts of the railroad’s path are unique to each particular context. The Society for the Anthropology of Lowland South America (SALSA) strongly urges the relevant and responsible authorities to carry out serious social and environmental impact studies to assess the effects of different routings on all potentially impacted indigenous populations. It recognizes the Brazilian government for indigenous impact reports for those groups to be directly affected along EF 354, the possible northern route within its jurisdiction. 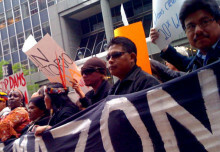 SALSA underscores that the indigenous peoples and indigenous organizations in the affected areas must be consulted and actively involved in the process of decision-making concerning the route, the development of necessary safeguards and impact monitoring systems, and plans for their implementation. Protected indigenous territories and nature reserves are of utmost significance in counteracting global climate change and carbon emissions. Any large project that impinges upon such territories and reserves must address its impact in this regard. SALSA urges the governments involved in and financing the Twin Ocean Railroad project to take the concerns expressed here into consideration in the feasibility study of the railroad and its routing, which is expected to be carried out during 2015-2016. We exhort the Peruvian, Brazilian, and Chinese governments to respect international conventions and regulations guaranteeing the rights of indigenous peoples, including the ILO Convention 169 (ratified by Peru in 1994 and Brazil in 2002), the United Nations Declaration on the Rights of Indigenous Peoples (UNDRIP), and the right to Free, Prior and Informed Consent (FPIC), which in the case of the isolated groups obviously must be through proxy. In Peru and Brazil, extensive national legislations guarantee the territorial rights and the integrity of indigenous populations, including isolated and uncontacted groups. The governments of both states are expected to abide by their respective national laws and constitutions.